Dear Believers, as we memorize this verse may we come to realize all that the Lord gives us! Many blessings are ours daily! Read and Listen to His written word, and from It you will receive wisdom, knowledge and understanding, plus much more. Follow His Living Word, Jesus Christ, and from Him you will receive every spiritual blessing! Believers, we cannot fail if we believe and receive all that God gives us! 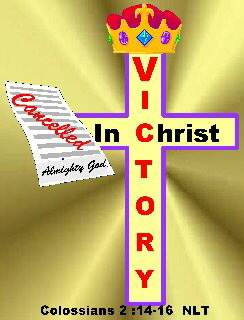 Believers, we have been given “the victory” which is Christ’s victory–the ultimate victory! It means “to utterly vanquish”! Christ defeated sin and death, and in Him we have that same victory. Memorize this verse and really ponder it’s meaning. It is a powerful verse and one all believers should really be very thankful for everyday! Blessings to you as you walk in “the victory” this week because of Jesus sacrifice and God’s grace!